We had our second Travelwild Tour during 6-11 July 2002. Our first trip with Travelwild in 1999 was to Churchill, MB, to see polar bears. This one was to the Brooks River Lodge in Alaska to see brown bears. Both trips were very successful as we saw a lot of bears, up close, at both places. arranged by Travelwild as part of our tour. Float plane is the only practical way to get there. The lodge includes a buffet meal service, a bar, and a great fireplace with seating for 12 around it. there is also an area with three small couches and a coffee table. 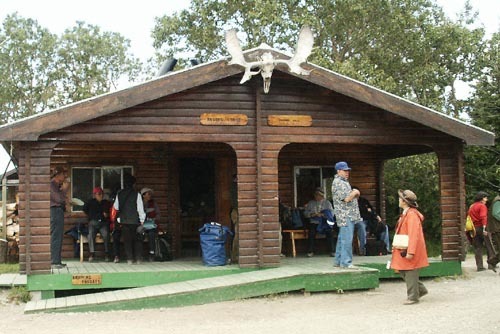 There are six cabins at the Brooks River Lodge. Each is about 12 feet square and has bunk beds for up to four people. Each has a toilet, lavatory, and shower, and an oil-fired heater. There is no closet. We had a space under the beds in our cabin large enough for suitcases. In another cabin, drawers were under the beds allowing suitcases to be unloaded, but no space for storing the cases. They slept with the cases on their beds. I only saw in two cabins. 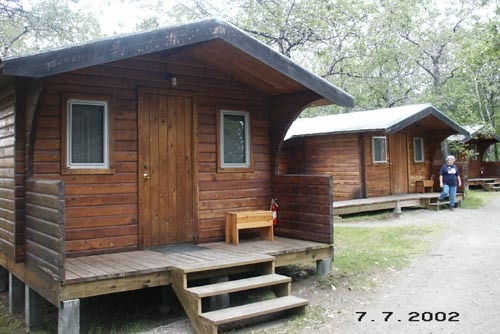 Travelwild occupied five of the six cabins for 7-9 July. We were divided with three men in each of two cabins, and twelve women in the other three. In addition to the six cabins, there is a campground with an electrified fence to keep bears out. Bears in the cabin area were common every day. This is two yearling cubs that paid a quick visit. A trail from the lodge, about a quarter mile long, leads to a floating bridge across the Brooks River. 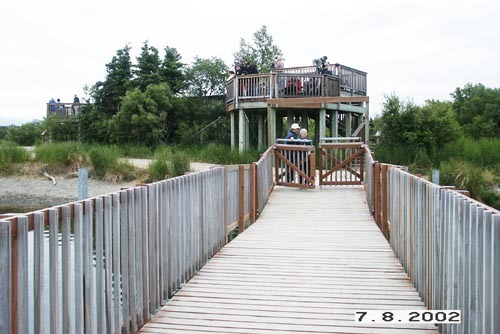 After crossing the river, an elevated viewing stand is available for watching bears in this popular area where the river empties into Naknek Lake. 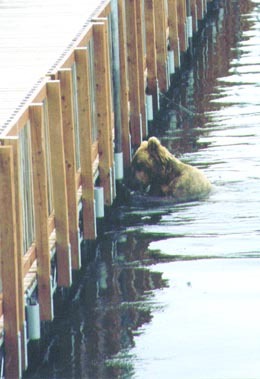 Bears often approach the bridge from both land and water. 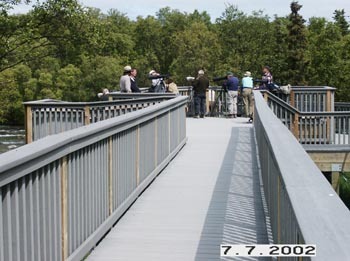 If it appears that a single bear will approach within 50 yards, or a sow with cubs within 100 yards, a ranger stationed on the viewing stand will direct everyone to get off the bridge and onto the viewing stand, or to return to the trail to the lodge. Another ranger is normally stationed on the trail to prevent people from the lodge walking to the bridge when a bear is present. The gates at each end of the bridge do not keep adult bears off the bridge, but probably do keep small cubs from getting separated from their moms. A smaller gate is at the viewing stand entrance. The bridge area of the river is a popular fishing spot, and many large salmon are caught there daily. 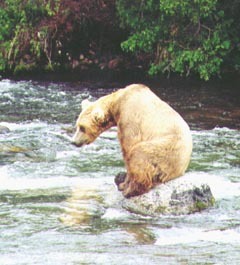 The fishermen must also move to the viewing stand if a bear approaches. 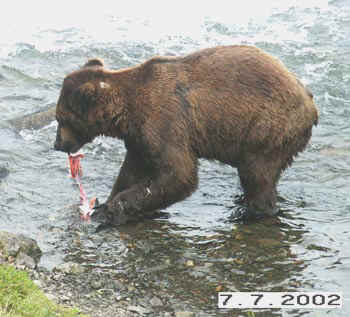 If a fish is hooked and a bear approaches, the angler must break their line immediately and not land the fish. The bridge is a popular place to watch the salmon swim through the shallow water. About 3/4 mile from the bridge you reach an elevated walkway that leads to two more viewing platforms. The first of these is the Riffle platform. The riffle area is very popular with young male bears. About 200 yards beyond the Riffle platform is the Falls viewing platform. This platform is often crowded, as shown here, and a ranger will limit the time an individual spends on the platform to about an hour during the crowded times. Crowding starts about 10 AM, and ends at mid afternoon. Each morning several floatplanes arrive with visitors that make a mid-day visit and then leave. I am guessing that 20 to 30 of these mid-day visitors arrive each day, but there could be more. 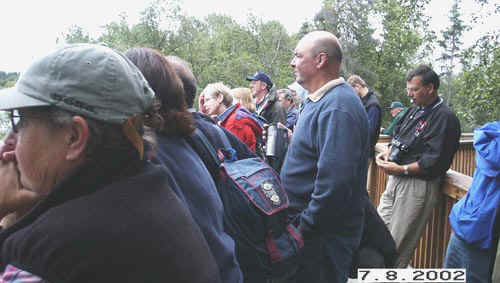 About 15 people can comfortably watch bears at one time from the two levels of the Falls platform. About 20 people make it crowded. There is a covered seating area where the Riffle platform walkway joins the Falls walkway where bear watchers can wait a turn on the Falls platform. There are no toilet facilities except at the lodge. The falls is the place everyone goes to see bears. 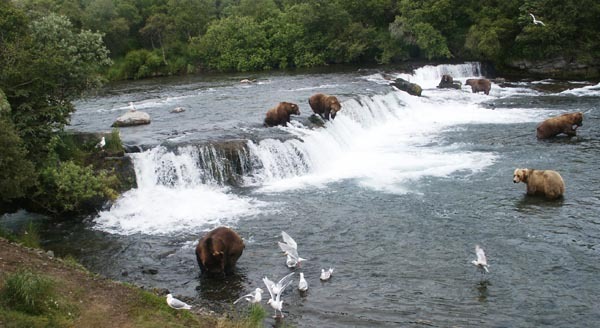 This is the place where bears at the top of the falls catch salmon in midair as they attempt to jump up the falls to reach their spawning area. This is also the place where large males are present. Smaller males, like the light colored one at above right, keep away from the larger males. Several bears have favorite places, and they all seem to know their pecking order. At times one bear would approach another that had a fish, and the one with the fish would would either drop it, or quickly leave the water with it. Leaving the water did not always prevent the other bear from following and taking the fish, but it sometimes did. The bear in the center, above, was in the best spot for this afternoon when there were few fish jumping. When he caught a fish, he would move to shallow water to eat, and the bear on the left would move over and "save his spot" until he returned. Most of the above pictures were made with a Minolta Dimage s404 digital camera, 35-140mm lens equivalent. The second, fourth, and sixth pictures from the top were made with a Tamron 28-200mm lens on a 35mm Canon camera. Good pictures can be made without a long telephoto lens, and even a throw away camera if that is all you have. I was not successful at catching a shot with the bear making a mid-air catch with a still camera, but did capture it several times on video. The bears would often approach very close to the viewing platforms. They ignored the platforms and the people on them. In fact, they never looked up at the people staring down. This bear is about 10 feet from the camera. 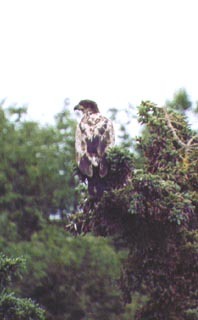 Notice the cuts on the front leg and behind the head. Several bears had cuts. These were probably inflicted in mating fights a few weeks earlier. 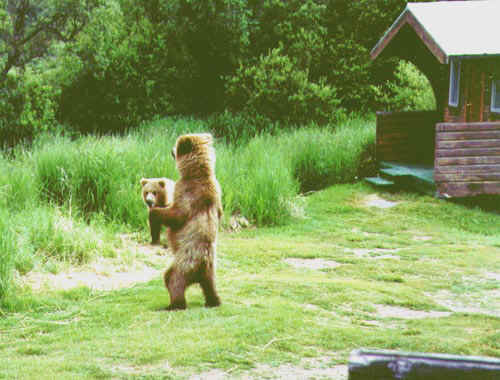 When we were there, no fights occurred, but some "jawing" did happen between bears to settle which was the dominant bear. There are pictures that require a longer telephoto lens to obtain a satisfactory shot. This was obtained with a 500mm lens. This large bear was at the far side of the river just below the falls. He appeared to be larger than all the others, but he never tried to take any of the more popular fishing spots. The 500mm lens was also necessary to obtain these pictures of two bald eagles that were in trees across the river from the viewing stand. 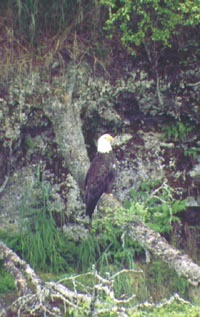 The bird on the right is a bald eagle that is too young to have the white head and tail of the mature birds. These shots were cropped in width when scanned. The 500mm lens also provided close-up shots of bear heads for the popular spots at the top of the falls. I met two bears up close. The first close bear was just after we got off the float plane. We were directed to go the flagpole on the beach where there was a trail up to the visitor center. All new visitors must first go to the visitor center where a ranger tells you what to do around the bears, and you watch a short video about bear safety. Just before we reached the flagpole, a bear came out of the trees and onto the beach about 20 feet away. We backed up and the bear followed. The plane unloading crew told us to turn around so we would not trip on the tree limbs and stumps on the beach, and to walk faster, but not to run. The bear was not interested in us, he just wanted to lay on the beach for a while. Both of the close bears were young, but still rather large. I would guess about 300 to 400 pounds. This is the second close encounter. It came up from the river onto the trail just as I approached the turn of the trail where the trail becomes parallel to the river before the bridge. I backed up and the bear came running. I stopped, and he did too. I told him to go away, and he did. This picture was extracted from video that I started when the bear came onto the trail. There is a lot more that I could tell about the trip and what we saw, but this page is to tell the viewer what to expect if he goes to see for himself. I recommend Travelwild as a tour service. If you want to make your own arrangements, or want a one day trip, go to the Brooks Lodge site for more information. Return to Trips of 2002. Return to Lewie's Home Page.